View More In Backpacks & Lunch Boxes. 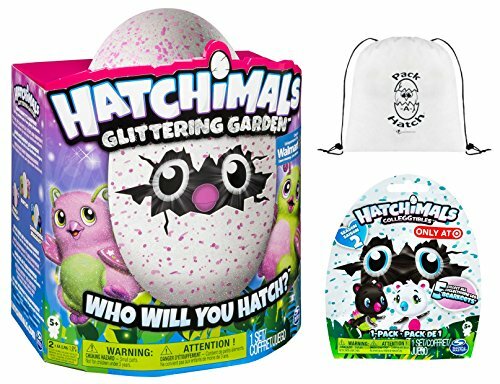 Hatchimals Glittering Garden Burtles are enchanted Hatchimals with soft sparkly fur and wings! Who's inside? It's a surprise! Each glittery egg contains one of two interactive Burtles and an exclusive glistening crystal nest! Love and care for yours inside the egg and its eyes will light up as it makes cute sounds, telling you how it's feeling! Once you've played with the egg enough, you'll see rainbow eyes - that means it's time to hatch! Hatchimals can't hatch on their own. Your touch encourages them to peck their way out of the egg! It's a once-in-a-lifetime experience! Now you get to raise your glittering Hatchimal through 3 stages, from baby to toddler, to kid. (1) Pack-a-Hatch Cinch Backpack (Manufactured and Distributed EXCLUSIVELY by HealthandOutdoors).